As the Burmese count down the days until Thingyan, a traditional celebration in which the locals playfully drench each other in water before Myanmar’s New Year, Sanctum Inle has rolled out a package making the most of the country’s biggest month. 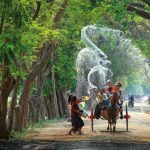 To be celebrated from Friday to Monday, April 13-16 before Myanmar’s New Year Day on Tuesday, April 17, the Thingyan water festival originates in a Buddhist version of a Hindu myth, signals the end of the hot and dry season and includes a slew of activities all over the country. Locals equip themselves with garden hoses, water pistols, bowls, cups, water balloons and even fire hoses to splash each other with water, symbolising the washing away of sins from the previous year. Sanctum Inle Resort is greeting this occasion with its “April – Full of Fun and Fascination” package, including two nights in a Cloister Deluxe room, a half-day sightseeing tour of storied Inle Lake, and use of the resort’s bicycles to venture through the spectacular countryside and quaint villages situated half on land and half on water. Pwè (performances) by puppeteers, orchestras, dance troupes, comedians, film stars and singers including modern pop groups are commonplace across the country during the festival. As the myth goes, Arsi, the King of Brahmas, lost a wager to Sakra (Thagya Min) the King of Devas, who in turn beheaded Arsi. An elephant’s head was placed onto the Brahma’s body, who became Ganesha and subsequently so powerful that if the head was thrown into the sea, onto the land and into the sky, it would dry up the water and scorch the earth and the sky respectively. Sakra then ordered one princess devi after another to take turns in carrying the head for a year each, with the new year signifying the changing of hands holding the head. 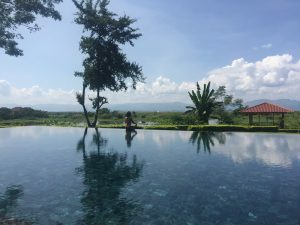 The 94-room Sanctum Inle resort, which celebrated its grand opening in October 2016, is situated on the banks of the lake and boasts a classic yet contemporary design, with arches and cloisters referencing monastic life. Priced at USD292 for up to two people, the package is available throughout April and also features daily breakfast for two, a set lunch or dinner, one complimentary airport transfer, 10% off spa treatments and laundry bills, and free access to the resort’s wifi, swimming pool other facilities.